My latest WorldNetDaily column is up, entitled "Have a Selfish Thanksgiving." I really enjoyed this article. I love our country and it breaks my heart when I realize where we are headed if things don't return to our roots soon. 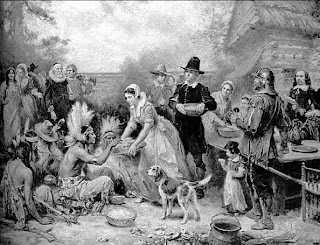 Never was much enthralled by the Pilgrims "First Thanksgiving" as (as every school child in Virginia knows), the first English colonists to have a Thanksgiving were much further south...at Berkley Plantation in Virginia! As usual, I agree with your perspective here and appreciate your telling the story in a far more accurate way than most of us learned in school. The only thing I'd add is the fact that these early settlers were the beneficiaries of a great deal of compassionate generosity and assistance from the First People. Their role in helping the newcomers survive and get established was far greater than is generally acknowledged, and we, their many generations removed grandchildren, know how much our ancestors helped their new and uninvited neighbors in those early years. I do realize the role of the Native People isn't the focus of your column, and I appreciate the point you're making. Liberal progressives, in their self serving myopia, appear to think they invented compassion and help for those truly in need. How sad and dangerous such a mindset is. Isn't that what freedom is? A chance to succeed or fail. That is all people need to get them going. Enter the government. They want a big fat return on YOUR labor! No, you should not benefit on the backs of people who drive this economy. Paying government UNION employees is not what I am working for. 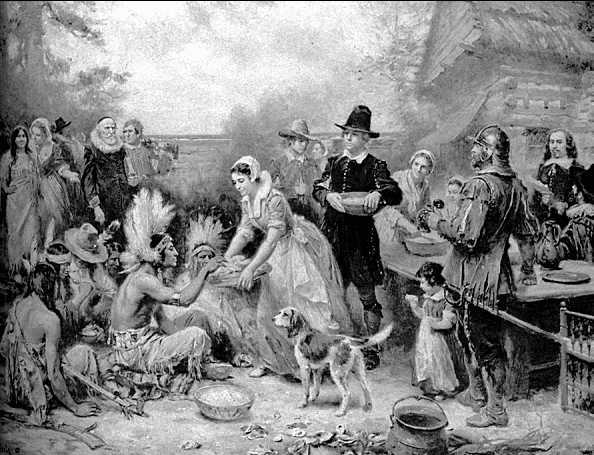 Patrice, thanks for telling the true story of that first Thanksgiving. That's exactly how it should be taught in homes and schools across America. I suspect a few more households next week will tell each other the true story now that you have expressed it so clearly on WND. The truth will out. Good will prevail. Wrongs will be righted. God Bless America. Welcome back AP. Just store that new knowledge away and it will be useful down the line. I watched that old movie Jeremiah Johnson this weekend(1972). It's about mountain men way back when. There is a pretty funny scene in that where he was trying to light a fire in a snowstorm. I enjoyed your Selfish Thanksgiving history lesson very much... i would like to have it published in my local weekly newspaper (after thanksgiving)... but it is a bit lengthy I have edited it down to 750 words, and think that might work. You are an amazing and quite prolific human being... keep up the good work. about editing the column. We need to seek permission from WorldNetDaily since they're the ones who have reprint rights, and I'm not sure how they'd feel about editing out a quarter of the column. I'm not saying they wouldn't give permission, I'm just saying it's best to ask. If you email me privately, I can cc our correspondence to my editor to see what he says. I would also want to approve any edits since it will be my name on the edited version. Thanks for understanding.